Douglas Miley is a self-taught artist who paints not to please but to involve the viewer in the beauty of the west. Preferring not to simply paint the scenery, he creates a mystical scene from nature, a sort of poetry in color. Douglas works meticulously with light, creating a brilliance and luminosity rarely found in art since the 19th Century Hudson River School influence. Born in a remote farmhouse in Ohio, Douglas credits his rural early life for instilling in him a lasting love and fascination with nature. At age 4, he began drawing with colored pencils, switching to oils by his eighth birthday. By age 22, he had already established a solid reputation as an accomplished landscape painter. For two years, he was an illustrator with the US Army, followed by eleven years as an illustrator for Campbell’s Soup Company. The chance discovery of an Arizona Highways magazine led him to pack up his easel and move to Prescott in 1977. Douglas spent nearly five years as a restorer of old masterpieces painted by artists such as Remington and Russell. Noted for his idyllic, romantic interpretations of the Southwest, he is especially recognized for his paintings of the Grand Canyon and Sedona areas. In addition to his original works in oil he has produced five limited edition numbered prints and three giclees. Although Douglas’s preferred media is oil, he is also proficient in pencil and pastel. He is listed in the book “Contemporary Western Artists.” The recipient of numerous state, regional and national awards, his paintings are treasured by many collectors in the United States, Canada, Japan and England. In 2001, Douglas garnered first prize in oils in the National Veterans Creative Art Festival, was 2nd in 2004 and again in 2005. In 2005 and 2006, he placed in the Top 100 in the National Arts for the Parks competition. In 2006 and 2007 and 2008 he received the People’s Choice Award at the annual Phippen Western Art Show and Sale Memorial Day weekend in Prescott, AZ. 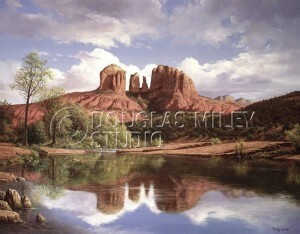 Douglas’s work is currently on display at Athena’s Heart Gallery located at 115 W. Goodwin, Prescott, AZ 928-778-2688. He shows at Prescott Center for the Arts, the Phippen Museum, and Sharlot Hall Museum. He is a member of Southwestern Artists Association (SWAA), Mountain Artist’s Guild, and Prescott Center for the Arts, and the Sharlot Hall Museum. He received the “Artist of the Year Award” for SWAA in 1995. He is presently on Linkedin and Facebook. You can view his paintings on www.mountainartistsguild.org. 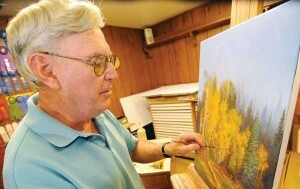 His studio is located at 1900 Forest Meadows Drive, Prescott, AZ 86303. Please phone him at 928-445-8079 for a review of his portfolio or to request a commissioned painting. All are welcome to visit his home studio.